Get ready to soar to stardom in this Pop Angel Wig. You’ll be a “hit” at any party as you belt out a few tunes. Or will you lip sync? At the very least you’ll look the part. The pop scene is full of blonde bombshells—all you have to do is choose your favorite, then find the right dress and accessories. Will you be a Brittany, or a Christina? Or, maybe you can fashion an outfit out of balloons or meat, if you’re daring enough. Imagine all of the hours it takes pop stars to look glamorous for their concerts. We realize you don’t have an entire entourage to smooth, straighten and perfectly style your locks, so we’ve come up with the next best thing! All you need to do is learn a bit of choreography. 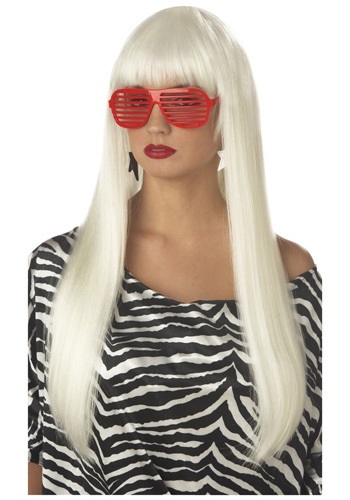 Then, rock your look like you’re going platinum…in your platinum wig, of course!